May 24, 2018 at 7:52 pm. CLEVELAND — This stage was made for LeBron James. The Cleveland Cavaliers face elimination against the Boston Celtics on Friday night in Game 6 of the Eastern Conference finals. And no player is better when his back is against the wall than James. In 21 games in which his team has faced elimination in the playoffs, James is averaging an NBA-record 33.5 points. He has played in seven of these with the Cavs dating to the 2015 playoffs, and not only is he averaging 36.9 points, 12.0 rebounds, and 9.1 assists in those games, he has scored 40 or more five times and Cleveland has won four of those games. And if the rumors are true, this could be James’ final game with the Cavaliers in Cleveland. He can be a free agent at season’s end and will consider coming back to the Cavs as well as a host of other options. Also on the line is James’ consecutive Finals streak. He has gone to the last seven, including the past three with the Cavs. So, yes, the stakes couldn’t be higher. And the player couldn’t be better in this moment. The Celtics have two chances to go to their first Finals since 2010 — the last year a non-LeBron team represented the East. That season, Boston knocked out James and the Cavs in six games in the second round, and James left the Cavs for the Miami Heat. 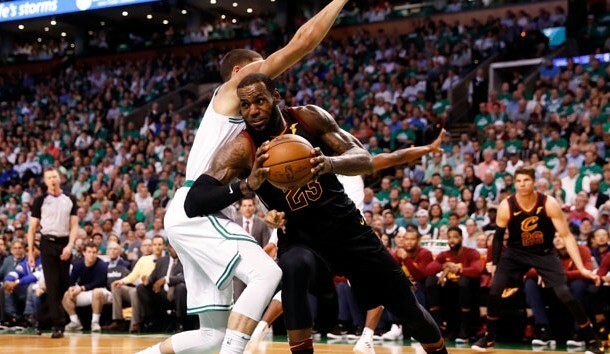 “At the end of the day, it’s incredibly hard to beat a good team in the NBA one time, and our focus is on what we need to do to give ourselves the best chance at being successful tomorrow night,” Celtics coach Brad Stevens said when asked about the emotional roller coaster of what’s coming for James in Game 6. The series is where it is because the Celtics won Game 5 96-83, even though they shot just 36 percent from the field. James finished with 26 points, 10 rebounds, and five assists but committed six turnovers and looked tired at times. Both Lue and James acknowledged that was the case. Boston’s defense, again, was smothering. The Cavs were forced into 15 turnovers. The Celtics changed their starting lineup and went big, inserting Aron Baynes for Marcus Morris but often playing both of them with Al Horford. Boston won the rebounding battle 45-39. Rookie Jayson Tatum scored 24 points for his ninth 20-point game in the playoffs, tying Donovan Mitchell and David Robinson for second all time among rookies. The Celtics played two pretty bad games in Cleveland earlier this series when they were pounded by 30 in Game 3 and didn’t recover from a slow first quarter in a 111-102 loss in Game 4. The last time the Cavs faced an elimination scenario — which means the last time they had to deal with the whole “LeBron’s last game” narrative — was Game 7 of the first round against the Pacers.